To avoid a multitude of headaches, organizations must maintain a clean provider directory. Over the last decade, Minnesota-based Allina Health has migrated patient and provider data from several EHR systems into a single EHR. During each of these transitions, the organization made a concerted effort to clean up patient duplicates. Over the last year, HIM professionals and others have begun to turn their attention to a similar but different problem: resolving provider duplicates. Data quality and integrity is—and always has been—Allina's focus, says Stephanie Luthi-Terry, MA, RHIA, CHPS, FAHIMA, director of enterprise HIM integration/eHIM business solutions. Accurate provider data are certainly one component of the health system's overall information governance (IG) strategy, she adds. More specifically, Allina Health, a 13-hospital system that includes more than 100 hospital- and community-based clinics, wanted to ensure it could accurately track meaningful use documentation for continuity of care documents and provide an accurate database the health system's own providers could use to identify the referring physicians to whom they wanted to send notes for continuity of care purposes. Allina's provider index currently boasts a total of 30,000 providers, the majority of whom are referring physicians not affiliated with or employed by the health system. Allina also wanted to address other challenges associated with provider duplicates, says Jeri Romano, RHIT, HIM data integrity manager at Allina Health. For example, a physician might not be able to electronically prescribe medications when a duplicate disrupts the interface between the ePrescribing system and the EHR. Duplicates also cause billing problems that lead to denials and rework. Many large health systems—especially those that include their own health plan—struggle with provider duplicates, says Lorraine Fernandes, RHIA, principal at Fernandes Healthcare Insights, which helps organizations develop and execute IG programs. She says all organizations, including small to medium-sized facilities, are becoming increasingly aware of the importance of provider data integrity. "The conversation is a lot more frequent and more at the forefront because of accountable care organizations [ACOs] and population health initiatives," Fernandes says. "As you're ramping up an ACO, you really need to understand who your docs are, what locations they practice at, what hours they keep, [and] what patients they're touching, so you can ensure you gather data to create the metrics and then substantiate that yes, these physicians have delivered higher quality care and are thus worthy of their rewards." Pay for performance is a significant driver necessitating the need to clean up provider duplicates, says Steve Kotyk, director of health care business development at ARGO Data Resource Corporation, which helps hospitals and health information exchanges identify and remedy duplicate provider registries. "It's important to keep information clean and synchronized," he says, adding that this allows organizations to aggregate across multiple care delivery settings. As hospitals continue to rely on EHR data for business intelligence, they'll begin to expand beyond patient data integrity to focus on provider data as well, Kotyk says. "[Provider data] are becoming more important as we look to exchange information between organizations and aggregate data at a regional level through health information exchanges," he says. But the journey toward provider data cleanup won't be an easy one, Fernandes says. "The uses of provider data are relatively new," she notes. "It's a journey that's going to take several years because of the diversity of definitions and stakeholders." Beth Just, MBA, RHIA, FHIMA, president and CEO of Just Associates, a consulting firm specializing in data integrity services, agrees. "You don't have the volume in sheer numbers that you have with patient duplicates because it's a smaller population that you're talking about," she says. "It just creates many other kinds of challenges." Managing provider data within an organization is challenging enough. Unfortunately, the problem of provider duplicates extends far beyond a hospital's four walls to include external data sources. These are the same sources on which organizations often rely to validate the accuracy of their internal directories. It becomes even more challenging at the federal level, says Fernandes, who estimates there are 10% to 30% duplicates in the National Provider Identifier (NPI) database alone. "When you're using this data for payment and reimbursement, you need to have a healthy amount of skepticism," she says. "It can be one of many attributes you can use to help identify a provider, but you should not rest the whole integrity of your provider on the NPI." Diane Ries, client services manager at ARGO, agrees that hospitals can't rely entirely on a provider's NPI as the sole determinant of his or her identity in a directory. One reason to be skeptical of the NPI is that physicians who practice across multiple specialties sometimes have more than one NPI. In addition, residents and medical students don't yet have an NPI even though they may be providing the bulk of the medical care, she says. To complicate matters, hospitals typically assign a separate internal system-specific code to each provider that may not be consistent across the enterprise, Ries says. For example, the registration/scheduling system may assign one number to a provider but the lab system assigns and uses a completely different number. This makes the NPI essentially irrelevant, Ries says. How can organizations address provider duplicates? Focus on IG, Kotyk says. "From a governance standpoint, you need to know who owns the data and who's responsible for it," he says. "Hospitals need to be aware that the physician master file is a point where there can potentially be errors and dirty data." Allina Health had already realized its provider database could be making it vulnerable to incorrect quality reports and compromised data integrity. That's why it worked with Just Associates to launch a large-scale provider cleanup project 18 months ago. The core team for the project includes data integrity, access management, the central verification office, enterprise integration, and various department leads. A separate steering committee includes health system executives. "We have a lot of executive support because the provider master does touch and affect a variety of different systems that we have within our organization that are used for reports and analytics," says Luthi-Terry, who describes the cleanup project as a "very thoughtful deep dive into our provider database." One of the project's biggest milestones was developing a consistent set of business rules to standardize provider data input. For example, registrars now default to a provider's legal name in the master file. Allina is also in the process of developing functionality that would allow registrars to enter a provider's preferred name in a separate field. The preferred name would be printed on all patient-facing documents, such as continuity of care summaries, wristband labels, and discharge instructions. Allina also created a roadmap of all systems that use and collect provider information. "It was very enlightening for us to see how many systems actually touched our provider master file in the EHR," Romano says. • End users in the patient care setting (eg, registrars, nurses, or physicians) identify that a duplicate has occurred. • The end user creates an electronic help ticket that's routed to either access management or the data integrity team for resolution. The data integrity team, which is embedded within HIM, manages patient and provider identity within the health system's EHR. • The individual handling the resolution opens the provider master file to compare demographic information. If necessary, he or she also refers to external databases and other sources to obtain additional provider information. • If the data integrity specialist determines the duplicate is the same provider, then he or she "soft deletes" one of the entries, making it invisible to the end user. • If the data integrity specialist can't determine whether the duplicate is the same provider, then he or she retains both records in the master file. 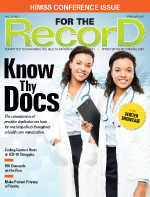 • Educate registrars about the importance of provider data integrity. Because they often receive illegible paper orders, registrars working in lab and radiology must be aware of the value of accurate data, Ries says. • Work temporary physician IDs proactively. These files end up corrupting the physician master file, Kotyk says. To ensure data integrity, someone must ultimately go back and associate the temporary file with a permanent and accurate record, he says. • Focus on referring physicians. "When you're handling credentialed physicians, you have a lot of information on them. [Hospitals] know who these people are and can keep track of them," Ries says. However, unaffiliated providers referring into the system cause the biggest problems in terms of duplicates, she says. These providers, many of whom are located out of state or even out of the country, must have information routed back to them for continued care, making it imperative they are entered in the system correctly, Ries says. • Consider turning off "add on-the-fly" functionality within the EHR. This functionality allows registrars to immediately add and finalize a new physician when they can't locate the individual within the provider directory. "They just keep typing in a name over and over again," says Just, adding that these on-the-fly physician entries tend to account for 50% to 60% of an organization's duplicates. • Partner with patients. Remind patients to bring referring physician information to appointments. This will allow them to provide accurate contact information during the registration process. • Urge providers to contact their licensing boards to update information. Name and address changes are particularly important. • Consider working with a vendor that offers specialized software to find duplicates. "The larger the organization, the more practical it may be to export the physician master file and send it away to a service organization for duplicate analysis and let them produce a report back to you," Kotyk says. Getting started with provider duplicate cleanup is just the beginning. Once an organization establishes a plan, it must remain flexible to adapt to new regulations and challenges as they arise. "Make sure that whatever system you develop is agile and innovative because you know there's so much activity going on in the broader marketplace for analytics, reimbursement, and consumer engagement," Fernandes says. • Who generates or uses provider data? This likely includes HIM, credentialing specialists, quality improvement, compliance, IT, physician services, and business analytics. Involve these individuals in any provider cleanup efforts. • How are providers defined? Is the definition limited to those credentialed within the health system, or does it include referring physicians and nonphysician practitioners? What about pharmacists who perform immunizations, or nurses, social workers, and psychologists who perform care coordination and patient education? According to Lorraine Fernandes, RHIA, principal at Fernandes Healthcare Insights, the definition may expand beyond clinical providers to include other provider types that potentially affect patient outcomes. For example, what about transportation service providers that transport diabetic patients to their appointments or durable medical equipment providers? • How will provider data be used? Fernandes encourages organizations to determine their current uses of provider data and their plans for future use. For example, is it possible to analyze data to determine whether a provider's prescription of durable medical equipment or advocacy for patient transportation enhances patient outcomes? "The list goes on and on as you begin to think about broad use cases of provider data today and the analytics and reimbursement that can be tied to those use cases," she says. • How will composites of each physician in the directory be created? Fernandes says to consider multiple sources, including state medical licensing boards, internal credentialing databases, federal databases such as those from the Centers for Medicare & Medicaid Services and the Drug Enforcement Administration, and other medical quality and consumer websites such as Physician Compare. Together, these sources can provide a more accurate and real-time picture of each physician and his or her attributes. • Who will address duplicates as they occur? Resolving provider duplicates could be an opportunity for HIM professionals hoping to lay the groundwork for IG, Fernandes says. However, the task is also well suited for compliance, physician services, and IT, she adds. Provider duplicates affect data analytics, quality reporting, billing accuracy, and care coordination. That's why it's in every organization's best interest to resolve these duplicates as quickly as possible—and understand why they occur in the first place. • The patient doesn't spell his or her physician's name correctly. As a result, the registrar can't locate the physician in the directory and creates a separate entry. • The physician's name is illegible on a paper order. The registrar subsequently creates a new entry with a misspelled name. • The physician uses a name different from his or her legal name (eg, Henry Smith vs Hank Smith), and the registrar doesn't realize it's the same person. • A physician gets married or divorced but doesn't notify the licensing board or the organization of a name change. The registrar then creates a new entry with a new name for the same person. • A physician changes his or her address but doesn't notify the licensing board or organization, leading to a new entry in the provider directory.